The fifth manifestation of Devi Durga is known as Maa Skandamata. She is fifth among Nava Durgas, thats why she is worshiped on the fifth Navratri. Devi Maa is the mother of Kumara Skanda or Kumara Kartikeya also called Lord Murugan in south India. Kumar Skanda was chosen by Gods as their commander in “Deva-Sura Sangram” (the war of gods & demons) against the demons. Lord Murugan’s glory has been narrated in the Puranas and he is referred to as Kumara and Saktidhar. His vehicle being peacock he is also called Mayuravahana. Thus being the mother of Skanda she is Skandamata. Worshipping Skandamata has on the fifth day of Navaratra has very iportacefor Yogis & Sadhaks . This day devotee’s mind reaches Visuddha Cakra and stays therein. In her image the Lord Skanda in his infant form is always found. She holds him in her lap. 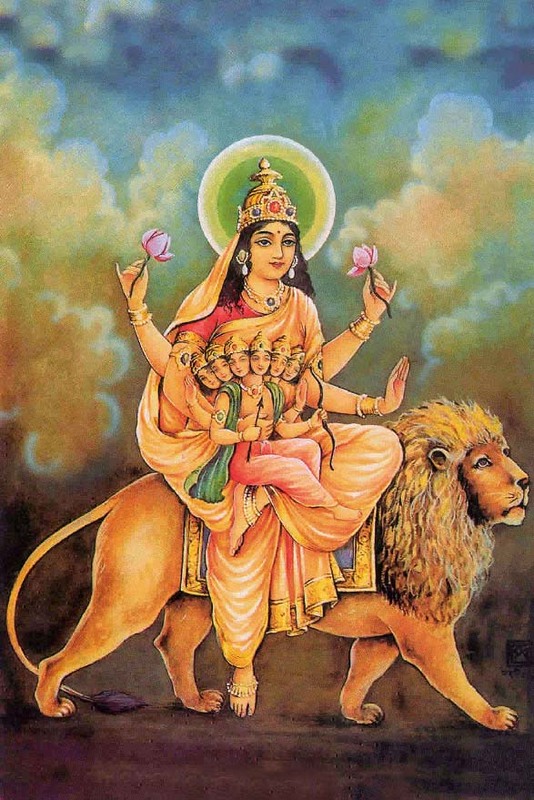 Using a lion as a vehicle, Mother Goddess has four arms & three eyes. She holds Lord Skanda in her right upper arm and a lotus flower in her right lower hand, which is slightly raised upward. The left upper arm is in a pose to grant boon and in left lower hand, which is raised, she again holds lotus. She is Golden color. She is seated on lotus flower so she is called Padmasana. The scriptures are very eloquent in glorifying the fifth day of Navaratra period. As the mind of the aspirant, on this day, is in the Visuddha Cakra. So all his actions internal as well as external completely stop and the mind bereft of all thought-waves, is calm like a wave less ocean. It would be advancing towards the state of pure consciousness. It is completely submerged in the meditation of Mother Padmasana, quite devoid of worldly thoughts or coats of Maya. It is time when the aspirant should be most careful and cautious on the path of his Sadhana. By worshiping the goddess in the form of Skandamata, the devotee gets all his desires fulfilled. He starts tasting the Supreme joy even in this very mortal world. The gateway for salvation to him is spontaneously opened. Her worship automatically includes the worship of Lord Skanda in his child form. Only she has got this pride of place. So the sadhak should particularly be attentive to her worship. Being the presiding deity of sun god, she bestows an uncommon luster and radiance on her devotee. He is always surrounded by an invisible divine halo, which always maintains his ‘Yoga-Ksema’. Therefore, we should try very sincerely to take refuge under her. There is no better way to moksha from this world.